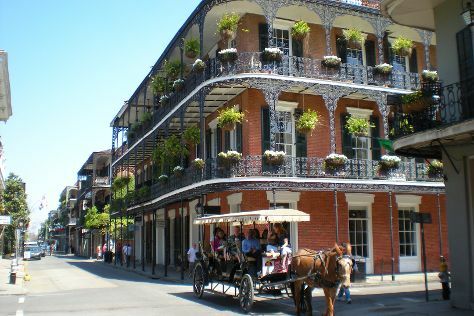 You've added Ultimate Swamp Adventures, New Orleans Pharmacy Museum, Confederacy of Cruisers Bike Tours, and other attractions to your itinerary. You'll discover tucked-away gems like New Orleans City Park and Jean Lafitte National Historical Park and Preserve. Step out of New Orleans with an excursion to Whitney Plantation in Wallace--about 52 minutes away. Next up on the itinerary: appreciate the extensive heritage of French Quarter, take in the spiritual surroundings of St. Louis Cathedral, brush up on your knowledge of spirits at Old New Orleans Rum Distillery, and paddle through the water with a kayaking and canoeing tour. To find photos, other places to visit, reviews, and tourist information, read our New Orleans trip maker app . Los Angeles to New Orleans is an approximately 7-hour flight. You can also do a combination of bus and flight; or drive. The time zone difference when traveling from Los Angeles to New Orleans is 2 hours. When traveling from Los Angeles in March, plan for a bit cooler days in New Orleans, with highs around 61°F, while nights are a bit warmer with lows around 61°F. Finish your sightseeing early on the 13th (Wed) so you can travel to Austin. You'll discover tucked-away gems like National Museum of the Pacific War and Willow City Loop. Get out of town with these interesting Austin side-trips: New Braunfels (Barn Pottery & Gruene Historic District) and San Antonio (Natural Bridge Caverns, Mission San Jose, & more). Next up on the itinerary: ponder the world of politics at Texas State Capitol, admire the striking features of The Driskill, and take in the views from Congress Avenue Bridge / Austin Bats. To see reviews, other places to visit, ratings, and other tourist information, read our Austin trip itinerary builder tool . Getting from New Orleans to Austin by flight takes about 4 hours. Other options: drive; or take a bus. When traveling from New Orleans in March, plan for a bit warmer days in Austin, with highs around 75°F, while nights are slightly colder with lows around 53°F. Cap off your sightseeing on the 17th (Sun) early enough to travel back home.